X-rays are an important diagnostic tool in dentistry because of their ability to penetrate and pass through body tissues. Because they penetrate at different speeds depending on tissue density (shorter and thus darker on exposed film for soft tissues, longer and lighter for hard tissues like bone or teeth), we’re able to detect decay which appear as dark areas on x-ray film. 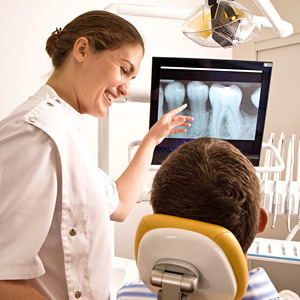 Without x-rays, the early detection and diagnosis of dental problems would be quite difficult. But despite its obvious benefits, it’s still a form of released energy that exposes patients to a certain amount of radiation. Since the potential health risk from radiation depends on the amount released (the dosage) and for how long and often a person is exposed, we must determine if the dosage and frequency from dental x-rays is a cause for concern. It’s a common misconception to view any radiation exposure as dangerous. The truth is, however, we’re all exposed daily to radiation from the natural environment — about 2 to 4.5 millisieverts (the dosage measurement for radiation exposure) a year, or about 10 microsieverts (one-thousandth of a millisievert) every day. In comparison, radiation exposure from routine dental x-rays is a fraction of this if measured over time. A set of four bitewing images of the back teeth produces 4 microsieverts of radiation, less than half the average daily exposure. One of the most comprehensive x-ray sets, a full mouth series of 18-20 images using “D” speed film, results in an exposure of 85 microsieverts, equaling about a week of normal radiation exposure. These thoroughly researched rates help demonstrate that regular dental x-rays are relatively safe. What’s more, x-ray technology has continued to advance since first used in the mid-20th Century. With innovations in film and digital processing, today’s equipment produces only 80% of the radiation exposure of earlier machines. In effect, we’ve increased our capabilities to more accurately detect and diagnose issues through x-rays, while lowering the amount of radiation exposure. Of course, a person’s annual exposure rate may differ from others. If you have concerns for yourself or your family about x-ray radiation exposure, please feel free to discuss this with us. Our primary goal is to improve your oral health without undue risk to your health in general.